G-Dragon of the boy band Big Bang was let off with a caution for smoking marijuana due to mitigating circumstances and his young age. "He smoked marijuana while staying in Japan to give performances there, but it was his first offense and he smoked only a tiny amount, so we decided to suspend his indictment," a spokesman for the Seoul Central District Prosecutors' Office said Wednesday. 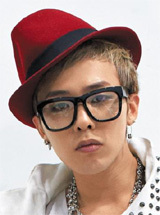 G-Dragon, whose real name is Kwon Ji-yong, told prosecutors he smoked a marijuana cigarette that "a stranger" handed to him at a club in Japan in May last year, when he and the band were there for a concert tour. He claimed that while the smell was different from an ordinary cigarette, he did not realize it was marijuana. Drug tests of his hair came up positive in July. Normally hair tests can detect marijuana until a little over a year after it is smoked. "We decided to release him without indictment this time because only an infinitesimal trace of marijuana was detected in his hair," the spokesman said. In a press release, the singer's agency YG Entertainment said, "We sincerely apologize for having failed to be more careful -- G-Dragon as a celebrity who is enjoying a great popularity among his fans, and YG Entertainment as his agency that should manage such a celebrity properly."